"Homer is a deeply vulnerable and complex character beneath his brash exterior." ‘Mother Simpson’ is not the greatest episode of The Simpsons, but it is my favourite. It presents the defining feature of what made its first ten seasons the greatest animated show and sitcom in television history: investment and subsequent pay-off in the viewer’s emotions. In the episode, Homer’s estranged mother returns having thought her son had died. Homer, too, had lived under the guise that Mona had died, having been told so by his father after she had fled the authorities. “It was either that or tell him his mother was a wanted criminal”, Grandpa explains. Homer’s character is of the everyman: he is dumb, dull, lazy, arrogant and self-regarding. Only, when it comes down to it, he is a loving father and devoted husband. Look only to the episode ‘Lisa’s Substitute’, starring Dustin Hoffman, to understand why his wrought relationship with Lisa reveals the deep self-awareness of his own flaws. Homer does not possess the vocabulary or the communication skills to express his emotions but does so in his actions and in putting his wants and needs after those of his family. He is the breadwinner, the protector and the provider. Four words: Do. It. For. Her. But Homer is a vulnerable and complex character beneath his brash exterior. On repeated occasion he alludes to how important popularity is, how his father never said he was proud of him and of seeing his colleagues succeed while he remains in a fixed state of financial insecurity and career stagnation. Much of why this is can be directed towards the absence of a maternal figure in his childhood. Scenes in ‘Mother Simpson’ show Homer as a child being adored by his mother before she left, being given the devotion and attentive care all children require to be equipped in the fragile environment of growing up. 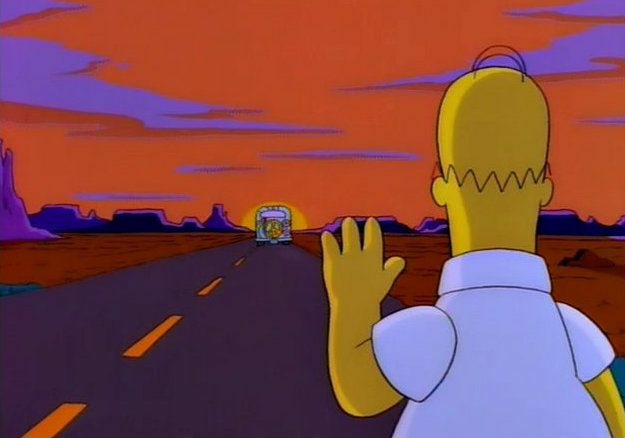 The final scene of ‘Mother Simpson’. When this warm and loving presence slipped away in the cloak of nightfall, a hole was created in his heart which would never heal until she comes back: those childlike feelings return and Homer becomes briefly nurtured and fulfilled once again. “At least this time I’m awake for your goodbye.” Mona’s first departure saw her say goodbye to a sleeping Homer, planting a soft kiss on the child’s forehead as he slumbered. “I thought I dreamt that kiss”, Homer explains later. Secondly, the final pieces of dialogue between mother and son equip Homer with the relentless devotion and presence of love in his life which he has needed all along, and which he has gone 39 years without until this point. They embrace for a final time, with the relief and happiness flowing through Homer’s facial expression no less than a work of animated art, summarising in one utterance of happiness the breaching well of emotion Homer has kept at bay his entire adult life. Heartache is free flowing at this point, with Homer’s final words to his mother: “Don’t forget me”, uttered as if he truly believes this is a possibility, showing that perhaps he believed she had forgotten about him all these years, meaning he had gone through each stage of life thinking he was not good enough to deserve even his own mother’s love — that love which is supposed to be irreverent, unquestionable and never-ending. Mona drifts into the desert horizons, leaving Homer alone once again to return to the pit of emptiness he has lived all along. 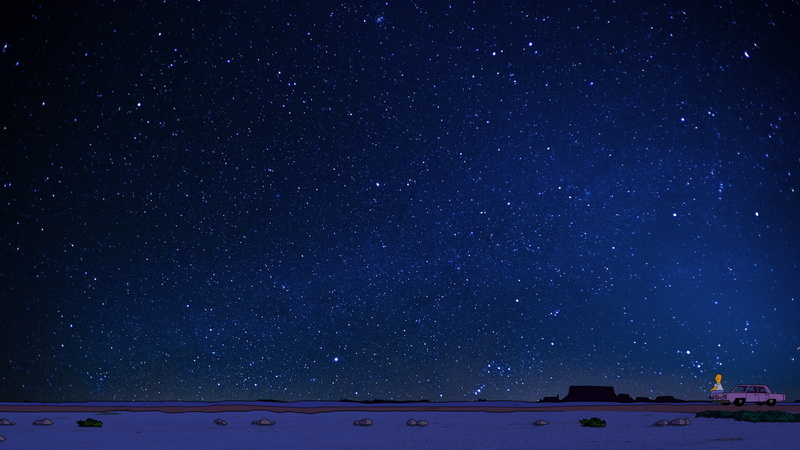 The final shot has achieved iconic status: simply Homer sitting on his car, with nothing left to do or say but look longingly at the stars, mourning the loss of his living mother for a second time.